How do you scale a support organization without breaking the budget or killing the quality of the customer experience? It’s an age old question for anyone leading a customer support organization, the sort of challenge that requires continuous innovation as a company and its customer base expands. With more than 30,000 customers and 100 people on the Customer Support team, we’ve come a long way from the team of just nine when we first shared a blog post on using Intercom to support our customers. Our belief in a modern support model will never change, but we’ve spent a lot of time iterating on how best to scale our support. A key part of our strategy revolves around automation, including our recently released Answer Bot, but there is more to scaling up than just machine learning and bots. Here’s a look at how we have managed it and how you can too. Support customer growth with increased headcount – this brings the benefit of maintaining a top notch level of service, but it also comes at a hefty financial and operational cost. Slow down response times, relying on strategies like no-reply email addresses and longer hold times, which will degrade your support experience overall. This option is cost effective in the short term but understandably unpopular with customers – and it is potentially detrimental in the long run due to its impact on customer satisfaction (CSAT) scores and employee retention. Launch intelligent and cost effective solutions that don’t degrade the customer or employee experience. These include automation with bots, strategies to drive customer self service and customer prioritization, alongside reasonably paced hiring. This approach to scaling customer support, however, is tough to get right as it requires an excellent set of tools, intelligent experimentation and a fair amount of cross-functional partnership. In scaling up our own customer support team, we have aimed for that third option, an intelligent combination of approaches rather than throwing money at the problem or letting our standards slide. We’re utilizing our own solutions, of course, but believe this balance of strategies can be adopted by any company facing the scaling challenge. The foundation for modern, scalable customer support is automation. We recently released Answer Bot, our intelligent bot powered by our Operator bot technology that automatically and instantly resolves your customers’ most common questions. We’ve found that on average, Answer Bot instantly resolves 29% of your customers’ most common queries and improves customer response time by 44%. From our experience, the upfront time investment that your team puts into Answer Bot by way of answer curation and improvement will more than pay itself back. Your organization and customers will quickly see the benefits as your team can increasingly focus on the questions that require a human touch. While it might seem like the use of bots is a less personal experience, in reality automated support can powerfully augment a great customer support team and strategy. Answer Bot’s reporting technologies allow you to monitor which answers aren’t delivering so that you can improve or retire them. During our product’s beta, we saw our answer delivery and resolution rates steadily climb each week as we improved underperforming answers and added more answers. Another one of our automation tools, Custom Bots, has shown early signs of success for Sales teams in converting website visitors, but it is also proving valuable from a Support perspective by more intelligently routing customer conversations, sending queries to the right team with much greater efficiency. As long as you focus automation strategies on solving the right problems, using it to tackle customer questions allows you to scale your support in a way that doesn’t put the customer experience, or your CSAT scores, at risk and can even improve it. It is important to provide a resource such as an FAQ page or help center so your customers can find answers to their questions early on. But once collated, these answers and resources can also be suggested to customers when they seek assistance – for instance, Intercom’s Operator can suggest Articles in the Messenger, encouraging customers to find answers while they wait on a Support team reply. This approach has saved our organization and customers countless hours. An additional win with the Articles integration into Inbox is the time saved as your team has instant access to appropriate answers – this means they no longer have to search through your knowledge base for an article in a separate window or tab. Another great self-service option is to launch a community strategy that allows customers to answer each others’ questions. As your customer base and product suite grows, you will have an ever-widening range of queries and issues to resolve. This means that constantly refining how you prioritize those conversations is of fundamental importance. 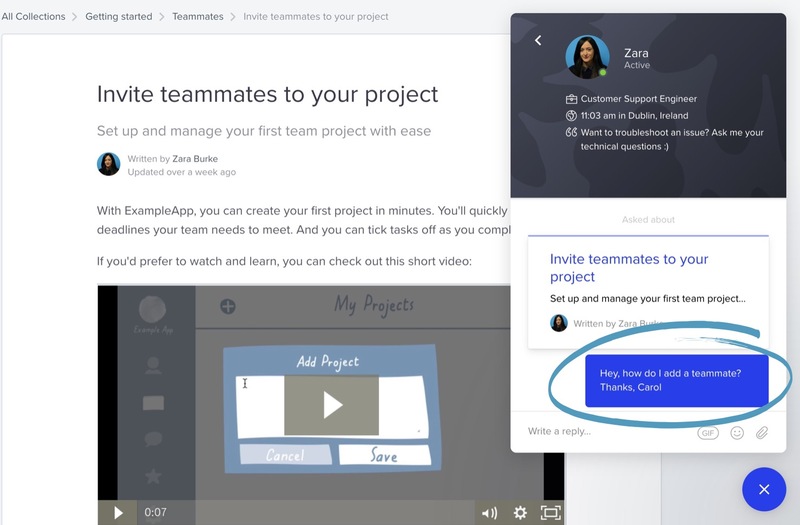 Intercom’s Inbox allows for smart team and customer segmentation through the use of multiple shared inboxes, enabling your team to easily prioritize conversations as well as quickly pass them to other teams for attention. An example of where this worked well for us is the launch of our Real Time Support strategy for new customers, a tactic that drove improved customer conversion and meaningful revenue wins for the business. Making smart use of Intercom’s Inbox routing rules, internal notes and @mention features are also great time savers for your team. Maximizing the benefits of automation, self-service and customer prioritization requires continuous iteration – after all, support looks a lot different at 10 people than it does at 100, and so on. identified key areas that impact employee engagement. I’d recommend an annual evaluation of each of these areas to ensure you’re effectively scaling your Customer Support team. This process takes a village and is a great way to engage your top performers and management team in evolving your organization. Finally, it’s important not to lose sight of your principles in this process. One thing that hasn’t evolved in our path to 100 support team members and 30,000 customers is our commitment to great customer and employee experience. In this regard, our cultural tenets are our greatest tool. We are driven by a commitment to connect personally and with empathy, and we believe in treating the problem rather than the symptom. Adopting tactics like automation shouldn’t come at the expense of your core values. These modern approaches and your principles are not mutually exclusive. Remember, if your business is growing, your Customer Support organization will scale whether or not you intend it to, but how you manage this scaling process, and how it will impact your budget and employee engagement, is your choice. And choosing the right tools to help you effectively automate tasks, drive customer self-service and make it easier to segment your team and customer base will be key to that process.